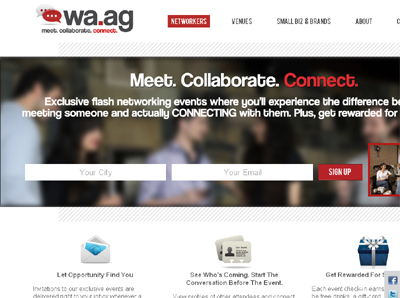 Wa.ag is a platform that bridges the online-offline gap to establish meaningful connections and opportunity for business professionals through the facilitation of incentivized collaborative get-togethers in bars, clubs, restaurants, and other venues during their off-peak hours. Unlike traditional networking events which typically result in a pile of useless business cards, Wa.ag events are designed to foster meaningful connections and create opportunities for those in attendance. Every Wa.ag event features a small business or brand, which comes prepared with challenges they are facing, products they want to test, or designs on which they want feedback. At a designated time during the event, attendees break into focus groups and share insights, feedback, and relevant connections with the featured company…all while networking with others in attendance. This natural icebreaking format allows people to show “who they are” as opposed to just pitching “what they do”, moving beyond superficial networking to something resulting in real connections and opportunities, not just a collection of business cards or an increase of followers on Twitter/Facebook. Benefits to the Venues: We drive business to their location during off-peak hours, giving them social exposure, building their brand advocates and helping to generate repeat business through word out mouth…all without the need to offer fire-sale discounts or incur any out-of-pocket costs. Benefits to the Featured Company: They get insight, feedback, suggestions, exposure, connections, and ideas from those in attendance. Meetup: The largest network of local groups in the world. Provides a platform that allows anyone to organize an event centered around any topic they wish. Meetup merely provides a framework for event organizers and does not specialize in a particular event type. Conversely, Wa.ag is dedicated to business networking and packages the people, venue, format, and the incentive for coming. All the event organizer has to do is show up at the event ready to gain insight, fresh perspectives and connections from those in attendance. GrubWithUs: Eat with awesome people. GrubWithUs allows restaurants and individuals to call social dining events to meet new people. They do a great job segmenting their population and achieving social networking, but their main focus is on informal gatherings and not facilitating business networking. Wa.ag provides a wider variety of venues, a diverse group of attendees, and an event format that result in meaningful connections among participants. Eventbrite: Platform for event organizers to plan events and sell tickets. Eventbrite provides a great platform for planning and promotion not event facilitation. While the Wa.ag platform is also is dedicated to not only planning and promoting events, we are really focused on maximizing the interaction, connections and opportunity creating by attending one of our events.